The CUBE, essentially a compressed form of BB2, offers more protein and less salt than any other consumption block. Ideal for the hard-to-reach spots, for hunting big bucks and for non-resident hunters. Contains the nutrients deer crave and the protein deer need; more protein and less salt than any other consumption block. 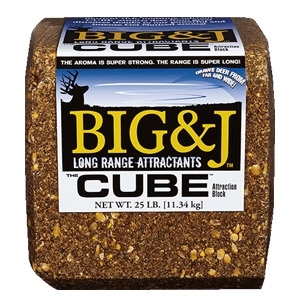 Available in 25lb attractant blocks.